Impaired blood flow that is present with diabetes can affect how well the body moves nutrients to the cells and tissues and removes waste. This can weaken the bones and gums, leading to increased susceptibility to periodontal infection. The higher glucose levels present in the mouths of diabetics also encourage bacterial growth. Combined with poor hygiene, this becomes a breeding ground for infection. The relationship between diabetes and gum disease is much like a double-edged sword. 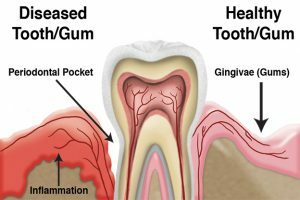 Once the gums begin to pull away from the teeth, pockets form that become infected and difficult to treat. This kind of serious infection can cause blood sugar levels to rise even more, which means that not only does the original diabetes contribute to the gum disease and make it harder to treat, but the infection in the gums may make it that much harder to control the diabetes. There is nothing good about gum disease. While it can be treated, the treatment is usually painful and expensive. Prevention is a far better option. This makes attention to good oral hygiene practices and close adherence to diet, medication and other parts of diabetic treatment protocol essential.